I have run 5 marathons since I started this 26.2 (or 42.2) madness in 2013 and I thought I'd be a bit more aware of what to expect by now. But no, I'm really not. Then again isn't that part of the draw of the marathon distance? The mystery of what can possibly happen to you over those miles. Facing down the challenge? The heat was crazy so I ran in a sports bra with my hydration pack for the first time ever on race day. I hit two pretty intense rainstorms after which the skin on my back basically just rubbed off. It's okay, the pain of half my toenails trying to leave my soaking feet took my mind off the back pain. Be prepared, test all your gear in advance and in the same conditions as race day if you can. Even though the second half of this race has more elevation, I ran it 10 mins faster than the first half. After I hit halfway I knew I'd finish, then my friend ran with me out of the blue for a little way and that made all the difference, I was doing this thing! The second half of this race is my strongest to date. I'm at home, I feel good, let's go out fast and see if I can keep it up! Walking at 11k, then some more at midway, then the rest. Ah nevermind, just finish, huge medal is waiting at the end. Know where you're at in your training, don't go out too fast and don't assume running 2 marathons in a month is a great idea if you want to run the second one fast. Pace yo'self. A uniquely challenging night race, I wanted to quit after halfway not because I was in pain, but because it just wasn't fun being cold and wet and running into a headwind. If you're struggling take one step forward, then another step. Stop over thinking, just move. Get your fuel in, I've found that affects my mental state a great deal. I had a strategy of running then walking through each aid station so I could fuel properly. I had trained mostly on the treadmill, including my longest run of 30km. At 32.2k I was on pace for a 7 min PR, but right there and with only 10k left I was done. I managed to cling on for a 1 min PR. Get your long runs in. You can train for a race on the treadmill (I still ran a PR after all) but you'll be in a much better place to do well if you run outside, add hills or at least mix up your runs. If I could give myself one piece of advice before any marathon, it would be train. 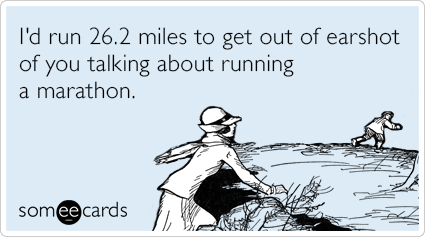 Complete the long runs, respect the marathon distance. There is no substitute for a solid base. It's so much easier to have a positive mental attitude when you're coming from a place of strength. Marathon running really is awesome, there's nothing in the world like that finish line. Am I right?! *As a Calgary Marathon ForeRunner I was given entry to the 2016 race, however all opinions and thoughts are my own. Terrific lessons, all! I'm hoping to run Calgary for the first time in May. Any particular advice? I'm a little worried about the elevation, given that I'm used to running at sea level and all.